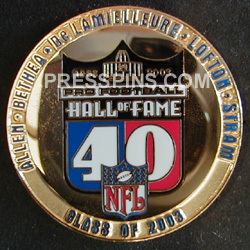 Pro Football Hall of Fame Class of 2003 Player Pin. 4100 of these pins were issued to HOFers, family and friends. Inductees: Allen, Bethea, DeLamielleure, Lofton, Stram.